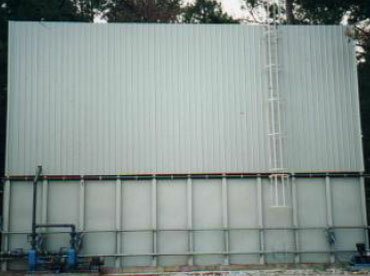 Abita Brewing Company located in Abita Springs, Louisiana, chose Waterworks’ DAF and TFEA systems to treat its high strength, moderate volume industrial wastewater. Their requirements are to reduce municipal sewer surcharge, keep land use to a minimum and produce a low BOD effluent. Waterworks’ system proved more than capable of handling shock loadings and flows much higher than originally stated in design consultations, as the brewery operates on a highly variable schedule with differing product runs. Waterworks installed a DAF system to remove insoluble materials such as husks, oils and grease and other organic constituents contributing up to 30% of the wastewater strength. Secondary treatment incorporates a Waterworks’ modular TFEA system for efficient handling of soluble BOD in varying flow situations. A secondary clarifier unit settles and recycles sludge to the activated sludge tanks. Waste sludge is digested in an aerobic digester and de-watered in a plate and frame filter press. Even with a 50% increase in plant wastewater flow consistently high organic loading, the Waterworks system continues to meet required discharge parameters.